Jonna is the Redguard owner of the Moorside Inn in Morthal. She's moved to Morthal with her brother Falion, and purchased the unsuccessful inn. Like all innkeepers, she rents out rooms, sells a small variety of food and ingredients, gives you information about quests through rumors, and gives you bounty notes when asked for work. She may start the quest Laid to Rest, and will provide information throughout if consulted. She wears a standard outfit of barkeep clothes and shoes. She carries an iron dagger and a selection of common pocket content. She tends the inn all day long, without ever sleeping. She's happy to welcome a new customer to her inn, as she barely gets customers anymore since the war, as she'll greet you with: "Welcome to the Moorside. If you need anythin', I'll be 'round. Good to have a customer." or "Finally, someone comes in. Kick off your boots, stay awhile. Let me know if there's anything I can help you with. I got nothing but time these days." She's not shy to admit the inn isn't doing well, as most of her other greetings bring up the topic: "There ain't much to offer, but if you wanna place dry to spend the night, I'll rent you a room. ", "Runnin' an inn weren't my plan. But Falion decided to move here, so I joined him. ", "Falion had his work to keep him busy, and I needed somethin' to do. So, here I am. ", and "I take what little business I can git. I'm grateful for anyone willin' to spend money here." To make matters worse, one of the few regulars is the bard, an Orc named Lurbuk, implied to be a terrible singer. She'll mention him subsequently on greeting her: "Ignore the Orc. He pays, so I let him stay. ", and "I've tried to explain to Lurbuk that his "singin'" is gonna get his throat cut." Finally, her last unique greeting will be a word of advice: "You'll want to be careful travelin' at night. The marsh is a dangerous place." You can ask her if business is slow, she will add: "Slow? No. It just ain't there at all. Few enough reasons to pass through Morthal before the war started. Now... Well, let's just say the front door doesn't get much use." Asking her what's with the Orc, she'll explain: "Lurbuk? Fancies himself a bard. He pays, so I let him stay. If I had any customers, I'd be worried about him annoying them. But, well... Look around." 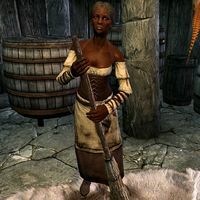 If you ask her about learning more on the art of magic, she will suggest like anyone else to head to Winterhold by assuming: "You lookin' for Falion? Why don't you go bother those mages at their College Winterhold and leave my brother alone?" Lurbuk: "Jonna, do you think the townspeople are warming to my serenades?" Jonna: "No. They ain't. And they aren't gonna. If you weren't payin' for your room, I'd have thrown you out a long time ago." Lurbuk: "Yes, but they'll come around eventually. You'll see." Jonna: "Oh, I shouldn't be surprised if they come 'round. And if you're never seen or heard from agin." Lurbuk: "I'm thinking of composing a song about you, Jonna. Would you prefer that I proclaim your beauty, your strength, your..."
Jonna: "Nah. Just... don't. Leave me outta it." Lurbuk: "No interest in being immortalized in song? Remembered and praised for all eternity?" Jonna: "No. I mean it." Lurbuk: "When I'm known throughout Tamriel, you'll regret this decision." Jonna: "It's as bad as ever." You can start Laid to Rest after you've approached the burned down house, but haven't yet spoken to Jarl Idgrod about it. Jonna can be asked if there's a story behind the house, and she'll explain: "Hroggar's house? It burned down not too long ago. It's a real pity about his wife and kid. The screams woke half the town. Most folk won't go near it now for fear it's cursed." When you ask her how the fire started, she'll add: "Hroggar claims it was a hearth fire. Some folks say Hroggar started it himself." As you continue "With his own wife and child inside? ", she'll elaborate: "That's what they say. See, he's living with Alva now. That started the day after the fire. It ain't right, movin' in with a new love the day after your kin die like that." When you suggest the guards can't prove Thonnir murdered the family, she'll confirm and directs you to the Jarl: "Aye. Our Jarl would sure like to know if he did though. Might even pay to find out." When you've found Helgi's Ghost, you can head to Jonna and tell her you've seen the girl's ghost, to which she'll suggest: "The poor child is probably beggin' for us to string up her murderin' father. Best tell the Jarl." After having defeated Laelette the Vampire, again you can ask Jonna what she knows about Thonnir's wife's disappearance: "Now there's a mystery. She ran away when the war started. Her husband, Thonnir, was devastated. No note or nothin'. I'm pretty sure she up and joined the Stormcloaks." This page was last modified on 21 April 2014, at 18:47.